restaurants-guides.com - restaurants guide to eating and dining in Louisiana, restaurants guides to Louisiana, USA - Last updated 3/3/2016. Louisiana is known all over the world for its Creole and Cajun style cooking, which is centered around the city of New Orleans. Influenced by elements of both Italian and French cuisine, restaurants throughout Louisiana serve a variety of regional specialties, many of which include seafood dishes. Restaurants throughout Louisiana are also known for serving variations of gumbo, a spicy stew / soup, with shrimp gumbo being particularly popular. Red beans and rice are also main ingredients in a number of emblematic dishes served in the state's many restaurants. Most cities and towns in Louisiana cater well for tourists, with a good selection of hotels, restaurants and attractions on offer. 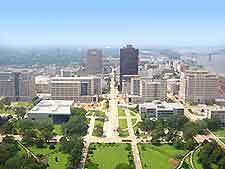 The many tourist destinations in the state of Louisiana include Alexandria, Baton Rouge, Bossier City, Kenner, Lafayette, Lake Charles, Metairie, Monroe, New Orleans and Shreveport.